By Jon Greenberg on Thursday, May 22nd, 2014 at 3:59 p.m. The uproar over allegations of secret waiting lists at a Veterans Administration hospital in Phoenix, and delays that potentially cost veterans their lives has opened the Obama administration to criticism that it was slow to respond to the VA’s own internal reports. Some also see a connection between troubles at the VA and the president’s signature health care law, the Affordable Care Act. On Fox News’ The Five, four of the show’s pundits built the case that if Obama digs deeply into the VA, it will raise more questions than he would like about how the Affordable Care Act is structured. "If he (Obama) shines a light on that, if we actually have some illumination there, then you're going to see this is really what the rest of you all are going to get: One big fat VA system in the form of Obamacare," Guilfoyle said. Using the same logic, co-host Eric Bolling later claimed that 500 people per year "are going to die waiting" for treatment because of Obamacare. Bolling’s claim has some fundamental problems -- we’ll address them in a bit -- but here we’re fact-checking Guilfoyle’s claim that Obamacare amounts to "one big fat VA system." The VA owns hospitals. Its doctors, nurses and technicians are government employees. The people who get care at VA facilities have served in the armed forces. These facilities are not open to the general public, and Congress appropriates the funds that keep the VA running. Under the Affordable Care Act, the government works with private insurance companies and health care providers to provide health care coverage. The government subsidizes insurance premiums for some people and sets minimum standards for insurance policies. But the health care system remains in the private sector. Private sector providers get paid by insurance companies and patients. There are thousands of private providers and hundreds of insurance plans operating in hundreds of markets across the country. In the case of Medicaid, the government plays the role of the insurance company and pays private providers based on a set reimbursement schedule. The government has not seized control of hospitals or nationalized doctors. We asked health care experts to assess the similarities and differences between the VA and the Affordable Care Act. The bottom line: it’s apples and oranges. Tom Buchmueller, who spent a year on Obama's Council of Economic Advisors and teaches at the University of Michigan, said he struggles to see any similarity at all. "Coverage through the exchanges is private insurance," Buchmueller said. Tom Getzen at Temple University said the VA is much like the institution that the veterans were once part of. "It’s an army," Getzen said. "In contrast, Obamacare is a complex legislative creation (with) the exchanges, expanded Medicaid and regulation." Getzen said, to call Obamacare the same as the VA "is kind of like saying your farm program is a post office." They both have government ties, but they’re fundamentally different and are operated differently. Scott Harrington, an adjunct scholar with the conseravtive American Enterprise Institute and a professor at the University of Pennsylvania Wharton School, described the changes under Obamacare as a step in the direction of a government-run health care system. "But it’s a long way from getting there," Harrington said. The idea that the Affordable Care Act was a "government takeover of health care" was named as PolitiFact’s 2010 Lie of the Year. Bolling took the comparison a step further, saying the sort of delays that took place at the VA in Phoenix would repeat themselves under Obamacare, with 500 people dying a year as a result. "President Obama wanted to insure 40 million new people under Obamacare," Bolling said. At the VA, he continued, the typical veteran has 13 appointments each year. Bolling applied that to 40 million new patients. "You're talking 585 million visits, half a billion visits," Bolling said. "If people are dying, how many people are going to die in Obamacare? Do the math. It will be about 500 people per year that are going to die waiting -- apples to apples." While we won’t fact-check Bolling’s prediction, we do think it’s important to point out two problems with Bolling’s math for people who saw the segment. First, the Congressional Budget Office projects that through 2024, 26 million people will gain coverage under the Affordable Care Act. So Bolling exaggerated the base number by about 50 percent. Second, the experts we reached said veterans have very different needs than the general population. Part of the massive growth in the VA workload stemmed from disorders related to traumatic brain injury and from the lingering effects of the Vietnam War defoliant Agent Orange. Bolling doubled or even tripled the number of doctor appointments of typical Americans, experts told us. "The average in the U.S. is between four and six," Getzen said. The U.S. Census Bureau reports that the average number of visits fell from 4.8 a year in 2001 to 3.9 in 2010. Point being: The math Bolling used to reach his prediction is quite flawed. 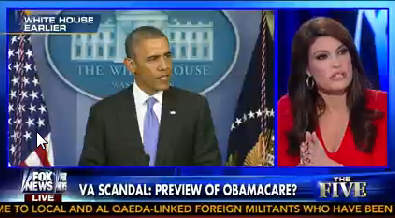 Guilfoyle said Obamacare is "one big fat VA system." We found no health policy expert who agreed with that comparison. The VA is owned and operated by the federal government. Its staff are government employees. In contrast, Obamacare builds upon the existing private sector health industry. The law sets standards for insurance and health care providers and it subsidizes premiums. Washington does run the Medicaid insurance program but even under that program, it is paying private providers. Published: Thursday, May 22nd, 2014 at 3:59 p.m.